Today's post comes from our Project Coordinator, Grace Bennett who will share ways you and your friends can make a meaningful impact during the holidays. If you're like me, your closest family is 8+ hours away. The months of November and December are always hard for me. 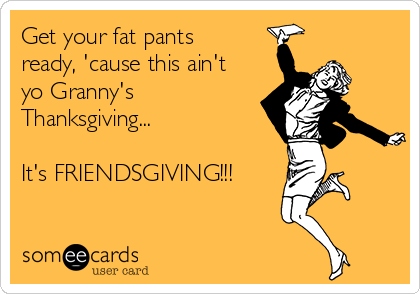 My friends talk about Thanksgiving at Granny's weeks before turkey day - some even have their family celebrations a few weekends early. One of my favorite ways to fill my house with love in November even if I can't be with family is hosting a friendsgiving. Friendsgiving is a Thanksgiving style dinner hosted for and by friends. Each year I invite all of my friends to my place and provide the turkey and drinks. Since I don't have time to do it all, I ask that some of my closest friends make the sides. We play some music, set out finger foods and set the table. Before long my house is filled with the friends I call my extended family. This year there was a catch. I provided all the food and didn't ask my friends to help set up. In exchange I asked them to bring items from Palmetto Place's wish list. Not only did we get our traditional Thanksgiving dinner, but we also helped provide for kids who have been abused or neglected and homeless teens. This year you can help the kids at Palmetto Place by hosting your own Friendsgiving dinner and encouraging your guests to collect items from our wish list. Download the list of needs here. While you're spending time with family and friends there are kids in our home who are spending the holidays away from theirs. The simple gesture of asking your friends to collect a few items can go a long way towards making sure each of our kids has a happy holiday. Did you host a meaningful Friendsgiving? We'd love to hear about it! Share in the comments section below.